The moving parts in your vehicle’s engine can cause friction when you drive, which generates heat. The cooling system in your vehicle pumps coolant (which is a mixture of antifreeze and water) through the engine chambers and absorbs the excess heat that is generated. The radiator serves to remove the extra heat, which allows the coolant to continue circulating. These are basic functions that keep your vehicle’s engine temperature at a safe level and protect it from heat damage. It essential to have a well maintained cooling system to keep your vehicle in peak performance and also ensures that your engine will run better and longer. A radiator fluid flush will keep your vehicle running cool under the hood. This may involve a simple flush, part replacement or more comprehensive repairs. According to most vehicle manufacturers, antifreeze replacement should be done at set time intervals or by mileage. 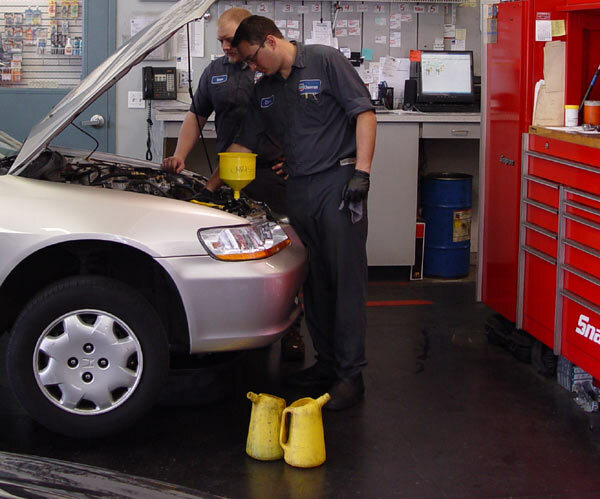 When you bring in your vehicle to Klahanie Service Center, our expert technicians will thoroughly check your vehicle’s cooling system and determine what services or parts may be needed. Our certified technicians will thoroughly explain to you any recommended part replacement or repair and will obtain your consent before starting any work on your vehicle. At Klahanie Service Center, our top priority is our you- our customer- staying within your budget and providing top-notch service.